Social media should work for your business. But I have witnessed countless businesses and blogs fall into the trap of spending hours a day on social media in an effort to help promote their business. Consider that for a moment. All the hours spend on social media are hours that you aren’t serving customers or selling products. It’s not profitable time for you and your business. It’s not time you can bill for, or time you can spend doing all the fun things in your business that make you love it so much. And sure, whilst social media marketing is important, it must serve a purpose. So, if it’s taking hours and hours every day, then now is a good time to ask yourself what you can start doing differently. When it comes to Instagram, here’s some tips that will get you started. Instagram has changed a lot of the years. In some ways it’s harder than ever to get noticed and promote your business, because they’ve changed the rules. In other ways, though, it’s actually easier. 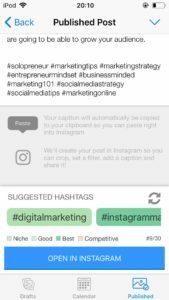 There are amazing tools on the market now that can streamline your Instagram efforts. That means you can use your time smartly, and get the biggest return for your time spent on the platform. 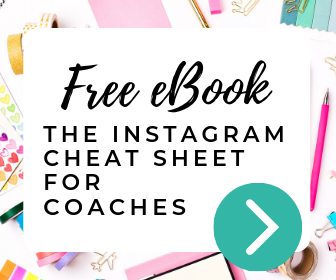 In fact, using tools and smart systems to run my Instagram accounts means that I can manage content for any Instagram account in less than 5 minutes a day. It’s very easy – just 3 steps, in fact. Stock photos – they used to be frowned upon, but there are some amazing sites out there now doing far more creative things than the whole “group of business people pointing at a laptop screen” thing. My recommendations are Unsplash (free), Stocksnap.io (free) and Depositphotos (not free but great value for money). Apps – I still love Wordswag! I’ve been using it for years. There are other apps that do similar things and I’m sure they are great too, but an app that can help you create a pretty looking graphic with an overlay of text in a nice font goes a long way – it’s a 2 minute task and can be used to create an uplifting quote or a promotional message. If you don’t already know, Instagram has now changed it’s policy of auto-scheduling. It never used to be allowed, so it was a bit of a pain having to log onto an app and copy and paste into Instagram every time you wanted to post new content. Now, you can schedule hundreds of posts in advance, set the date and time and let it run. I used to be a loyal customer of Crowdfire. Actually I still am and I use it a lot for Twitter. It’s still great. 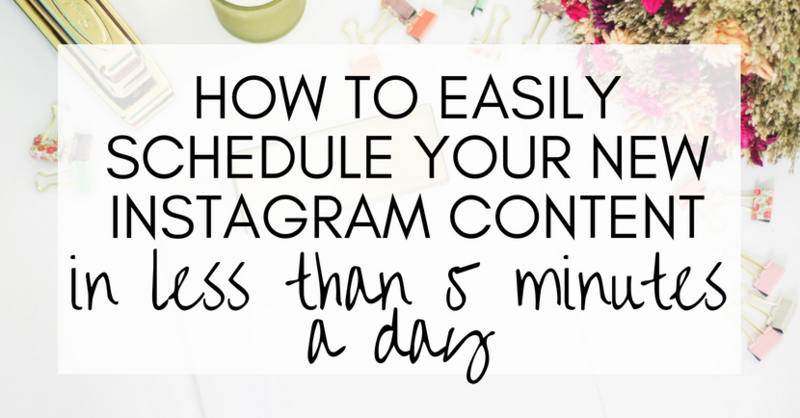 But when it comes to Instagram, there’s a new kid on the block and it’s saving me a lot of time when it comes to scheduling Instagram content – Tailwind. The reason I switched to Tailwind was really down to a few extra features – the first is it’s hashtag finder. I use Tailwind as an app on my phone and when I am creating a new piece of content to post, it gives me hashtags suggestions based on what I have previously posted. That’s pretty useful, but what’s even more helpful is that it tells me what hashtags are the best choices – it rates them as competitive, good, best and niche. Those of you paying attention will have noticed I mentioned two reasons why I switched to Tailwind. 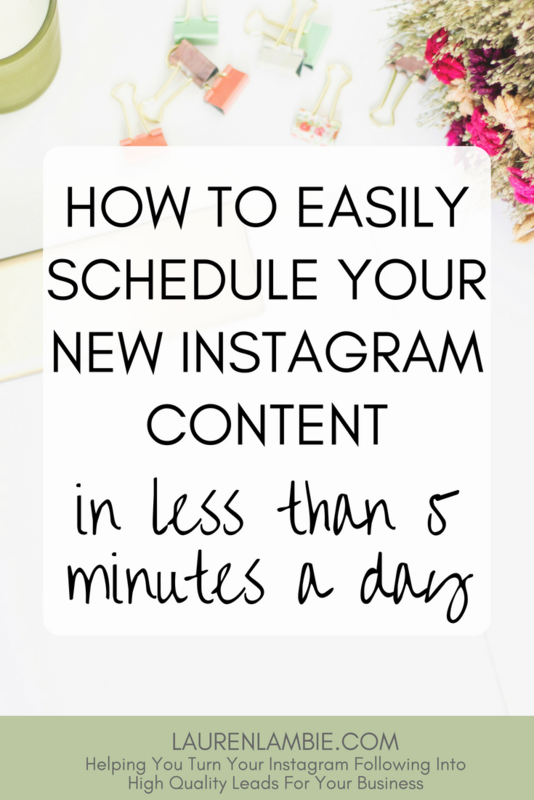 The second is that it is easy to reschedule previously posted content to Instagram – it’s pretty much just one click of a button and it gets rescheduled to the next available slot in your content calendar. Use that feature! Many Instagram users pride themselves on producing hundreds of original pieces of content and whilst that is great and can be applauded, don’t shy away from reusing good content. If it’s worked for you before, it will work for you again and will reach a new and bigger audience. Minutes 0-2 open up wordswag. Choose a template or background image (it uses Pixabay’s library of free stock images). Write a promotional message for your current launch. Write it, choose a font, and save the image. Minute 2-4 – upload the saved image to Tailwind (using the app, so this is all done from your phone). Add a caption. It will be scheduled for your next available slot on your pre-determined scheduling calendar. Add some recommended hashtags. Click to schedule. Minute 5 – When it’s published, log onto Instagram. Check for comments. Interactive with your audience. Browse your feed. Like content that inspires you. Voila! Done – and in just 5 minutes. Of course, you can do more than this to grow and promote your account. I always recommend posting around 3 times a day, and it’s nice popping onto Instagram throughout the day to engage and interactive with other people on there – especially your followers. But in terms of keeping your Instagram account fresh and current, and working for your business, you can certainly work smart with your time. If you really want to be efficient with your time, batch-produce your content at the start of each month. 90 pieces of content – 3 times a day. Spend the start of the month planning, producing and scheduling it. Then, all you need to do is make sure you are regularly logging on to Instagram and interacting with your audience. Interesting approach this. Do you use hashtags if you have low followers count? I am a fan of wordswag and I use it daily for instagram and pinterest. Nice tips here and a nice guide to follow….